1/4 oz. 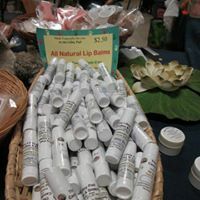 Lip Balm Pots or Tubes - $2.50 each. Minimum order of 6 in same flavour. Flavours available - blueberry blitz, root beer, pina colada, cherry vanilla, strawberry, banana, peppermint pattie, vanilla malt milkshake, orange cream vanilla, cotton candy, raspberry blitz.